Need help with your strategy? We’ve got you covered! We can tailor the keywords in your advertising campaigns to the stage your customers are at within the buying cycle. For example, a customer or prospect at the research stage of the buying cycle is likely to conduct a search using generic keywords, whereas a prospect that is further along in the buying cycle and is aware of the products available, is likely to search for specific product names. Returning customers who are familiar with your brand and service offering are likely to search for your brand name. We can optimise your long tail, generic and branded keywords with the aim of capturing customers across all stages of the buying cycle, increase conversion opportunities and provide the highest return on investment. As suggested in the title, long tail keywords are the longer, specific keyword phrases that visitors are likely to use when they are approaching the end of the buying cycle. 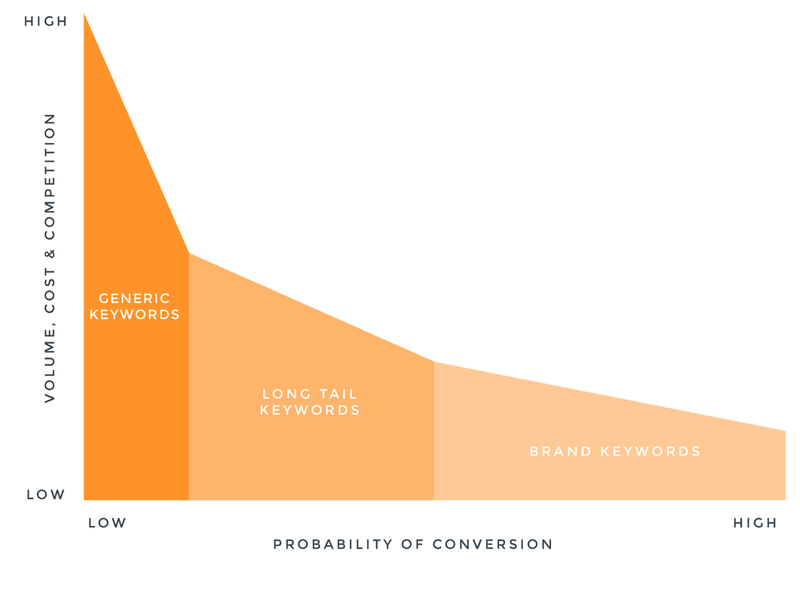 As a result,long tail searches often drive the highest return on investment. As part of your PPC keyword strategy, we can build comprehensive long tail search campaigns, containing the keywords that are most profitable for your business. Generic keywords have a broader reach than long tail keywords. When prospects are at the research stage of the buying cycle and have not yet selected a specific brand or company to purchase from, generic keywords help them to discover your business. We use generic keywords to attract new users, increase the volume of targeted traffic that is driven to your site and attract users to your business at the beginning of the buying cycle. Brand If you have an established product, company or brand name, we can invest in your brand keywords. The benefits of this include helping your brand to dominate search engine results pages with paid and organic ads, more control over your brand messaging and driving more prospects to your site instead of your competitors’. Pictured above: Keyword strategy based on volume, cost and competition. A customer or prospect at the research stage of the buying cycle is likely to conduct a search using generic keywords, whereas a prospect that is further along in the buying cycle and is aware of the products available, is likely to search for specific product names. Alternatively, a customer may use words like ‘buy’, ‘price’ or ‘quote’ in their search, showing an intent to buy.